The SoftEdge™- Springfree has a soft edge, which is over 30 times more shock absorbent than the safety pads on a traditional trampoline. The FlexiNet™ safety enclosure- the patented Springfree Trampoline FlexiNet™ enclosure has flexible supports to cushion jumpers and prevent falls. The jumper is directed back to the centre and cannot make contact with the net rods. The net is also zippered to ensure jumpers cannot fall through the opening. Springfree is a SoftEdge™ trampoline that uses strong, flexible composite rods in place of springs with a Flexinet™ enclosure that keeps the jumper from falling off the trampoline. The Springfree Trampoline does not have safety pads around the edge because it doesn't need them. The SoftEdge™ itself has much more give in it than normal safety pads. 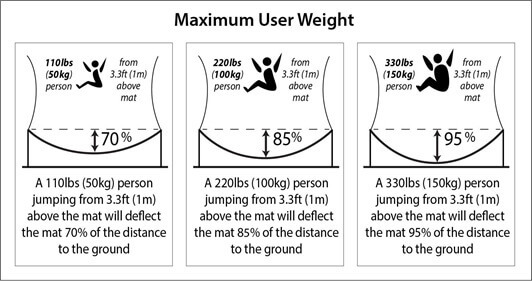 In fact, the Springfree Trampoline edge is equivalent to the 70mm thick padding used on Olympic standard trampolines. Other trampolines have enclosures - what is different about the Springfree™ Trampoline enclosure? 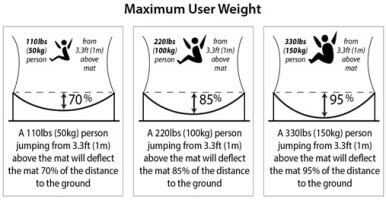 Our FlexiNet™ enclosure system is designed to catch wayward jumpers and guide them safely back to the center of the mat. Is the Springfree Trampoline weather proof? Can it stay up through all seasons? All components of the Springfree Trampoline are weatherproof, including rust-free, UV protected mat and net rods, powder-coated galvanized steel frame and a UV-resistant polypropylene mat and safety enclosure. A Springfree Trampoline can be used all year round and does not need to be covered or packed away even during the harshest summers or the coldest winters. Yes. The high performance rods on a Springfree Trampoline are housed in light plastic sheaths that protect the composite rods from UV deterioration. These sheaths may deteriorate over long periods of time as they take the full force of UV exposure but they can be replaced. For further information, please contact Customer Care at +33 2 31 89 00 28. You can purchase a Springfree Trampoline online from this website, by visiting a Springfree Trampoline Store or by calling our team at +33 2 31 89 00 28. Springfree Trampoline is delivered nationwide by a shipping agent. When you order from Springfree Trampoline the shipping agent contacts you with a delivery date and a time slot. No we do not offer layby or financing in Switzerland at this time. Quality is at the heart of everything that we do and we are proud to have engineered the World’s Safest Trampoline. We are confident that it will stay that way for many years to come which is why we offer such a comprehensive warranty. Even better, when you register your new trampoline with us, we will DOUBLE the warranty. Further information on our warranty is available from our Customer Care Team at +33 2 31 89 00 28. Springfree offers installation services in some regions and can be ordered with the shop. If installation is not available in your area, we recommend you view the resources available at http://www.springfree.ch/new-trampoline-installation-videos-tips where installation tips and videos are available for your viewing. Springfree is pleased to offer a full complement of replacement parts available for purchase. Please contact our Customer Care Team at +33 2 31 89 00 28 to place an order.